Wednesday, April 25th, was Earth Day and Hewlett Packard had an employee's-only fair. Companies from around the Willamette Valley showed off their environmentally sound products and I was able to showcase my artwork and talk to many people about wildlife art and the role it can play in conservation. The above print was one of the grand prizes in a raffle that HP held for their employees. What a great event! When I get pictures I will post them on this entry. Below is a series of four photos that shows the progression of the painting Into the Open. This first image shows the large, blocky brushstrokes that I use when I first start working. On the right of the painting you can see a good example of this, while on the left you can see where detail begins to get worked over the larger strokes. More trees in the background have been added as well as more detail in the grasses and a couple of the aspens. The foreground in front of the aspens remains very basic still. Here, you can see the painting has taken quite a leap. The elk is in and the grasses and trees are quite detailed. If you scroll up and down between the bottom picture and this one, you can see things that haven't been added yet like foreground detail, detail in the aspens and the far background. Right now, I am getting ready for the unique and special Peppertree Art Show this May down in Santa Ynez, CA. Entering it's 30th year, the show, which is hosted by Bob Eubanks of television fame, takes place on the Peppertree Ranch in an old horse barn that has been beautifully restored into an art gallery. If you are interested in more information about the show, click here. The above painting is one that I am currently working on for the show and it will hang with 5 or 6 more of my paintings. All told there will be about 350-400 paintings and sculptures from nearly 70 nationally and internationally collected artists in the show. 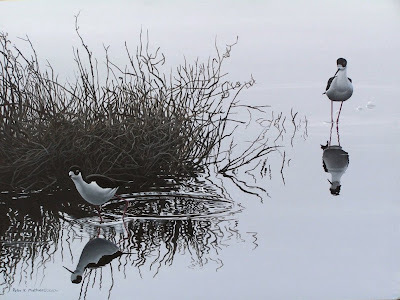 Not only is April 15th tax day, it is always the deadline for submitting to Birds in Art - the most prestigious wildlife art show in the world. This show attracts artists from the far corners of the world to submit artwork for inlcusion in their annual exhibition at the Leigh Yawkee Woodson Art Museum in Wausau, Wisconsin. I have been fortunate enough to be included twice so far out of 5 submissions, and this year I am hoping for a third acceptance. Around the end of May artists can expect to get either "the large envelope"(you're in!) or the small envelope (the 'thank you for applying' letter). I'll let you know which letter I receive when I get it. The above painting is my submission this year and the one I feel has the best chance of being selected. I finished it! This painting is one that has been in progress for a few months even though it is a small piece at 9"x12". The reason for the delay was figuring out exactly where to put the raindrops and the bits of habitat. What excited me about doing this painting is the fact that the pintail drake is standing in the rain. So often, waterfowl is painted with perfect light and perfect weather, but this is more typical of the winter weather this duck may encounter - especially where I live in Oregon! 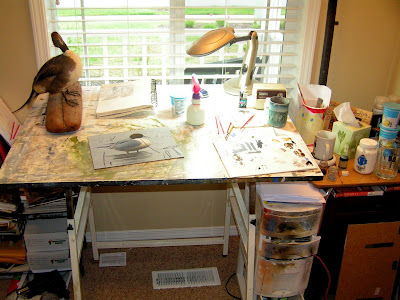 Here is a picture of the 'working part' of my studio. 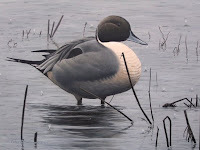 On the table is a painting of a pintail that is near completion and should be posted as tomorrow's blog entry (hopefully). Elsewhere, you can see the pintail mount that I am using as reference, my sketchbook with the above painting idea on it, and the various brushes I use. I normally start out with a large flat brush and increasingly get smaller as I get more detailed in my paintings. Right now, because the pintail is almost finished, all of the brushes are small. You can also see various yogurt cups around. Those are to hold large amounts of mixed paints. If I don't keep a color that I use frequently it is almost impossible to remix the exact color. Underneath there is storage for paints, reference, and other supplies. 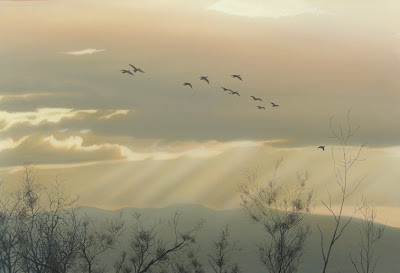 I just received the 2007 Ducks Unlimited Event Merchandise catalog in the mail and on the first page is my painting "First Flight"(left). It is an honor to have a piece of work selected to be published by Ducks Unlimited and, best of all, the prints will be used to raise money that will directly benefit waterfowl and waterfowl habitat. 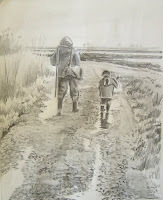 The print will be auctioned at most of the Ducks Unlimited banquets throughout the country this year. Classic Art Prints in Milwaukie did a fantastic job of precisely reproducing the original painting into a limited edition print. My family and I will be spending this Easter up in Salem with my wife's sisters after attending church here in Albany. The day is sure to be filled with an Easter Egg hunt, lots of chocolate bunnies, and a big dinner. Although we all enjoy the frivolities of Easter, especially the kids, we always take the time to recognize the true meaning of this special holiday. Have a Happy & Blessed Easter. Rocky Mountain Ridge is an original painting that was created specifically for the the Cascade Chapter of the Rocky Mountain Elk Foundation and will be auctioned off April 14th in Stayton, OR. The painting's title is a play on words that describes both the habitat in the painting and the cause. 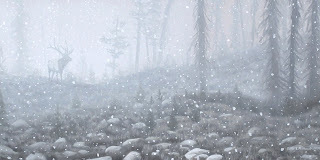 The artwork showcases a majestic bull silhouetted against the first snow of the season. If you don't get a good look, he may soon turn and disappear without a trace... as they are known to do. 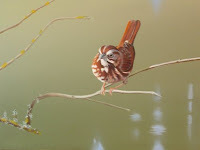 This is a painting that I started a couple of weeks ago of a song sparrow - one of the most common sparrows where I live. There will be more detail on the branches, particularly the top branches, and maybe a couple of strands of grasses coming up from below the image. Also, I am really focusing giving the bird personality and making it seem alive. This is a smaller painting that measures 9x12.